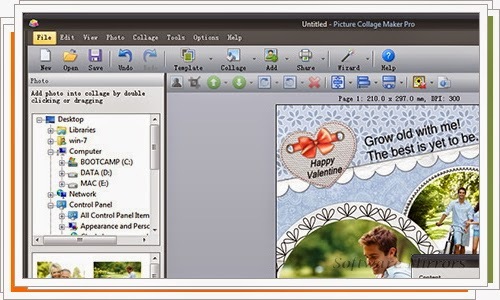 Picture Collage Maker is a friendly and powerful application for editing collage type of presentations. Picture Collage Maker give you several options for editing your photo album. With Picture Collage Maker you can collect different pictures and images in a single setup with the ability to add sound effects, text, texture, filtered special, shadows, transparencies, adjust the brightness, color, resize images, add frames to your photos with different styles and many more. Picture Collage Maker also includes Wallpaper Slideshow program to design wallpaper with the same procedure. If you have no experience in the management and composition of images, if you don't want to use those complicated editing programs, if you just want to make a colorful and personal presentation, Picture Collage Maker is a tool that will be helpful and useful.